Zeus persuades Atlas to repent for his sins against the gods by supporting the world on his shoulders. 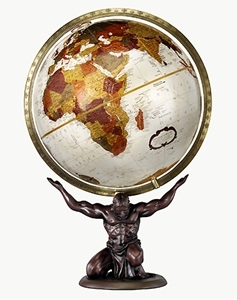 This 12" antique ocean globe has a full meridian, a bronze resin replica of Atlas, contains more than 4,000 place names and has distinctive political boundary markings. The Auburn has contemporary design & bold craftsmanship. 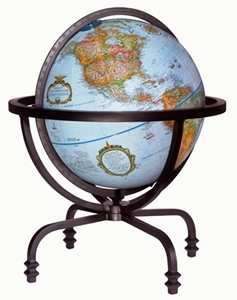 Handcrafted from wrought iron, the Auburn has a black matte finish, ornate detailed legs and center post, a 12" blue ocean ball, a calibrated full meridian & contains more than 4,000 place names. 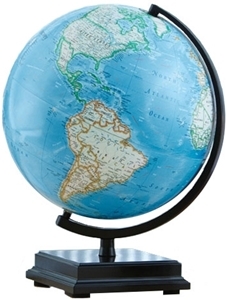 The Discovery Cambria Globe features 12-inch blue ocean globe with a metal semi-meridian mounting on a black lacquer finished wood base. 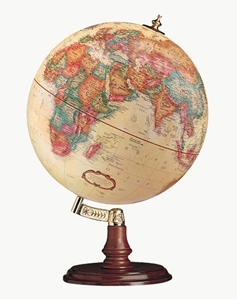 This globe displays political boundaries and looks great with any decor! This 12" illuminated globe has a gracious combination of an antique ocean globe ball, a solid hardwood base with rich walnut finish & a die-cast semi-meridian. Also contains more than 4,000 place names and has distinctive political boundary markings. This exquisite desktop is a 13" diameter blue lapis ocean globe beautifully inlaid with over 25 different semi-precious gemstones that have been hand carved into the shape of countries and continents. 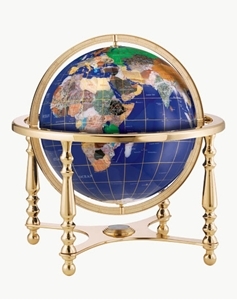 A gold colored stand & meridian with built in compass cradles the globe. 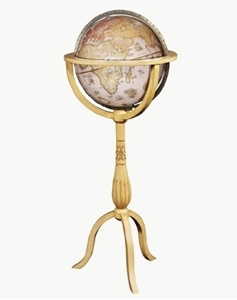 The Compass Rose World Globe has a 12" antique ocean globe ball, a calibrated antique brass plated semi-meridian, a die-cast antique brass plated base, contains more than 4,000 place names and has distinctive political boundary markings. 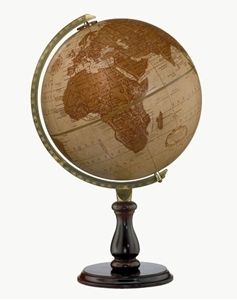 The Cranbrook World Globe includes raised relief features, a 12" diameter antique ocean globe ball, a solid hardwood base, contains more than 4,000 place names & has distinctive political boundary markings. Without a meridian, your view of the world is unobstructed. The Crystal Marquise offers silver land coloring with black and maroon type & distinctive political boundary markings. Enduring appeal of a globe, but with a modern, visually stunning twist. 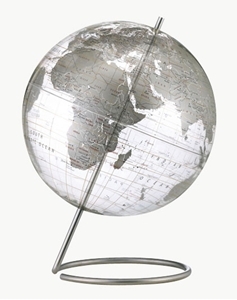 The transparent 12" globe ball is bisected by a stainless steel axis base. 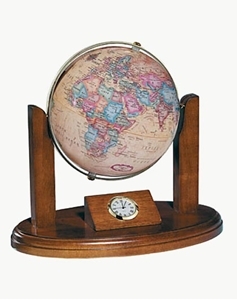 A hugely popular gift globe, the Executive World Globe features a quartz clock, a 6" diameter antique ocean globe ball, a brass plated full meridian with gyro-matic mounting, and a walnut finish wood base. Battery included! 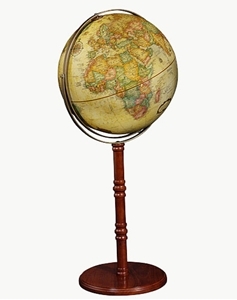 This 9" world globe has a gracious combination of an antique ocean globe ball, a solid hardwood base with a rich walnut finish & a gold colored molded meridian. Also contains more than 4,000 place names and has distinctive political boundary markings. This world globe ships Free in the continental United States! 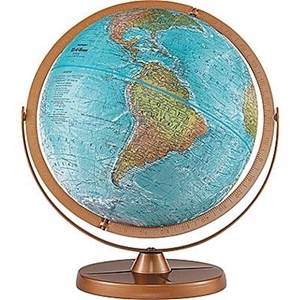 This 12" diameter political world globe includes raised relief geographic features, a gold painted metal base, a numbered semi meridian, an antique ocean globe ball, contains more than 4,000 place names & has distinctive political boundary markings. 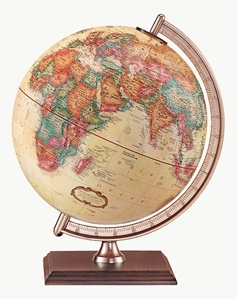 This world globe ships Free in the continental United States! 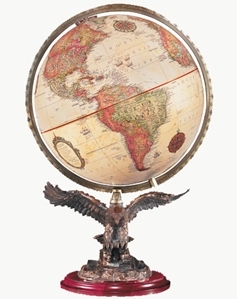 This 12" antique ocean globe ball with a numbered die-cast meridian that features a magnificently detailed resin eagle with bronze finish and gold accents, contains more than 4,000 place names and has distinctive political boundary markings. 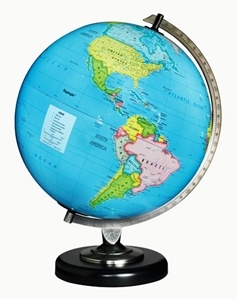 This globe ships Free in the continental United States! The Hastings enduring appeal comes from the 12" antique ocean globe ball, a solid walnut finish hardwood base and a die-cast semi meridian. This world globe contains more than 4,000 place names and has distinctive political boundary markings. 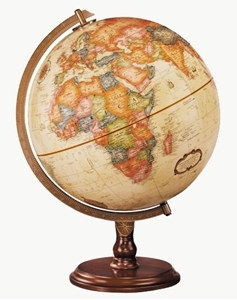 This world globe ships Free in the continental United States! Coventional and distinguished. 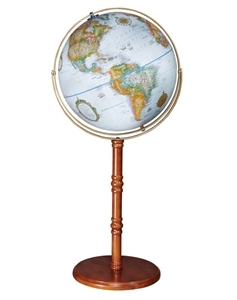 The Kingston features an antique ocean 12” globe ball, a solid hardwood base with rich walnut finish, a die-cast antique plated semi meridian, contains more than 4,000 place names and has distinctive political boundary markings. 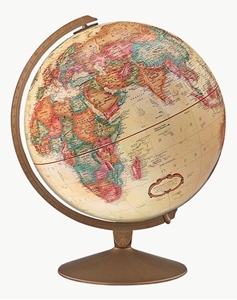 This world globe ships Free in the continental United States! 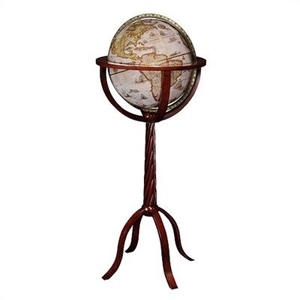 This exclusive desktop accessory offers a genuine leather 12" antique ocean globe ball, a die-cast semi meridian mounted on a hardwood base, contains more than 4,000 place names and has distinctive political boundary markings. 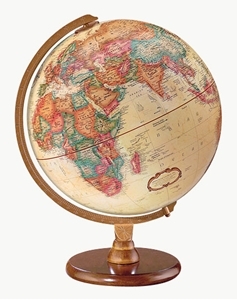 This world globe ships Free in the continental United States! 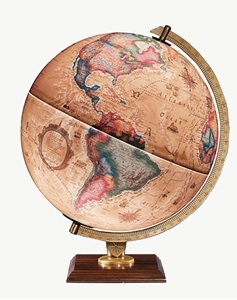 The Lenox World Globe has a classic & enduring appeal. The gracious combination of a 12" antique ocean globe ball and a solid hardwood base with a rich walnut finish. Also contains more than 4,000 place names and has distinctive political boundary markings. 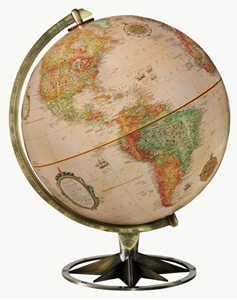 This world globe ships Free in the continental United States! This 3.5” diameter blue ocean globe ball amazingly levitates between a polished silver toned arm and a silver molded base. 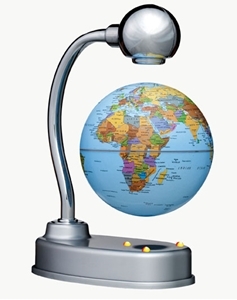 Lights on the base illuminate when the globe is in the proper location to easily float in the air. Electricity needed. Perfect for office, study or living room. 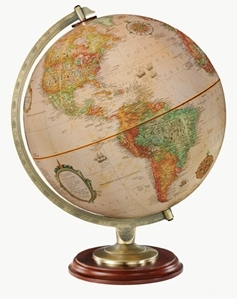 This world globe ships Free in the continental United States!